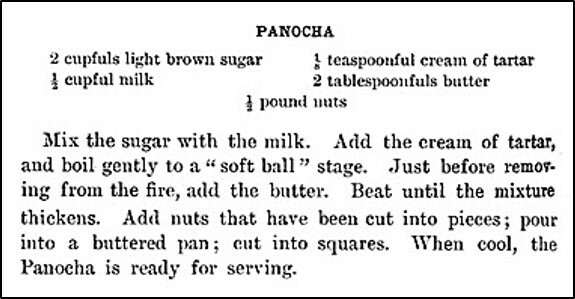 When it comes to holiday cooking at my house, old-fashioned candies are a “must make,” so I was thrilled to find a hundred-year-old Panocha recipe. 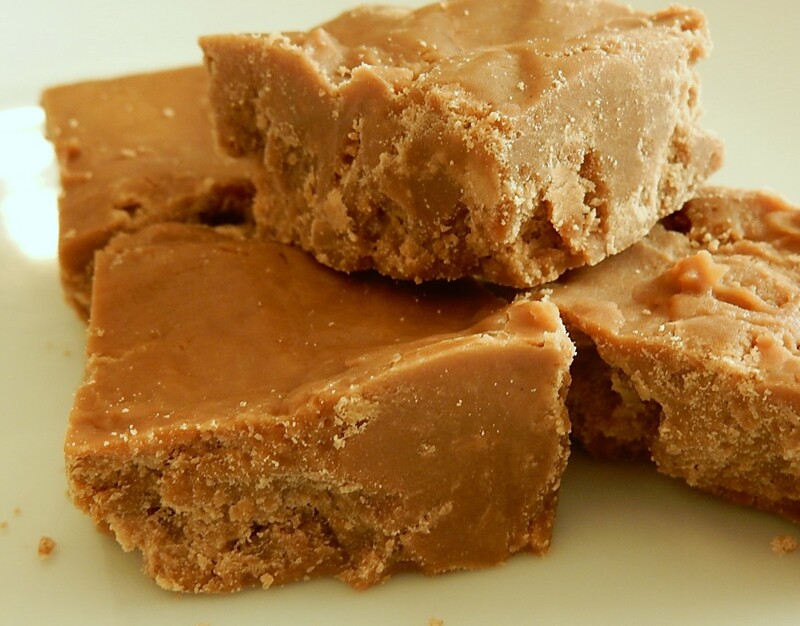 Panocha is a delightful old-fashioned brown sugar fudge with the typical walnuts. Combine brown sugar and milk in saucepan; add cream of tartar and stir. Continue stirring while heating over medium heat until the sugar is dissolved. Quit stirring and bring to a slow boil. Reduce heat to low and continue boiling (without stirring) until candy reaches the soft ball stage (235-240 degrees F.) (about 10-15 minutes). Stir in butter and remove from heat, beat until the mixture thickens. Stir in walnuts. Pour into a buttered 8 X 8 inch pan. When cool, cut into pieces. 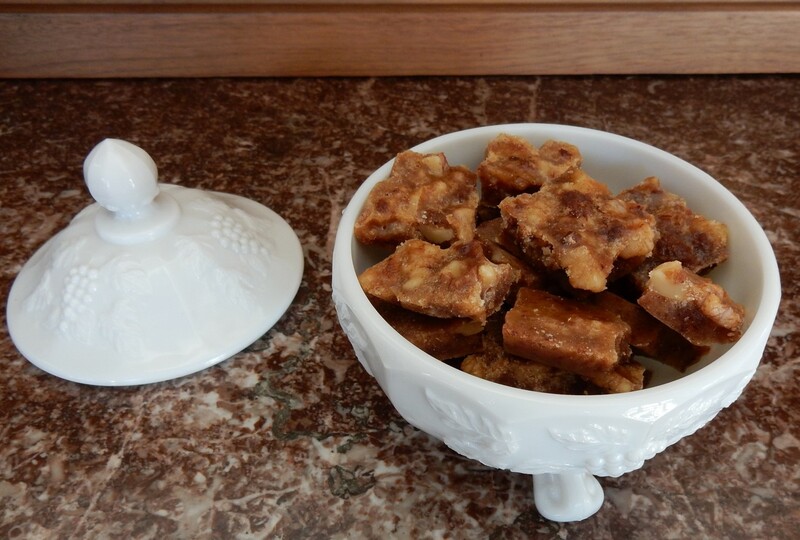 The caramels with walnuts were made using the hundred-year-old recipe. 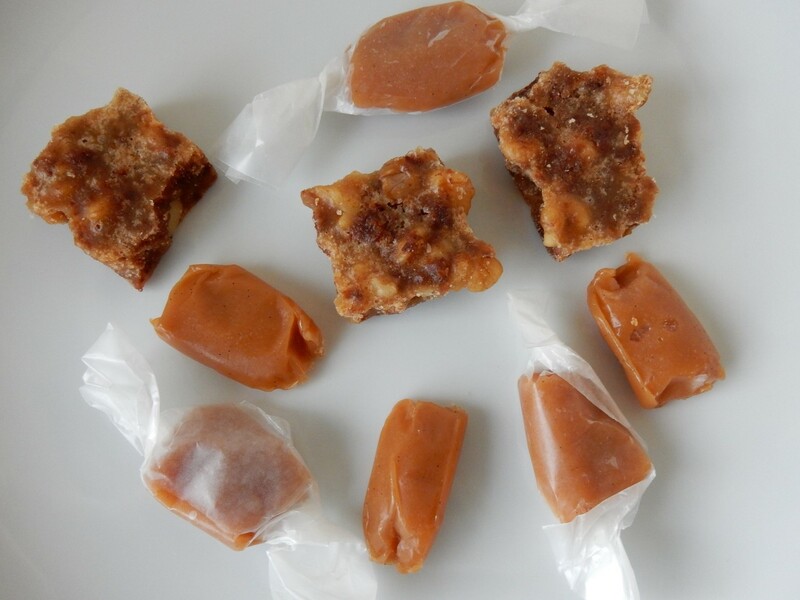 The other caramels were made using the modern recipe. The holidays are a time for family fun, so when my daughter was recently home for Thanksgiving we decided that it was time for another post that compares a hundred-year-old recipe with a modern one. This year we decided to make Caramels. 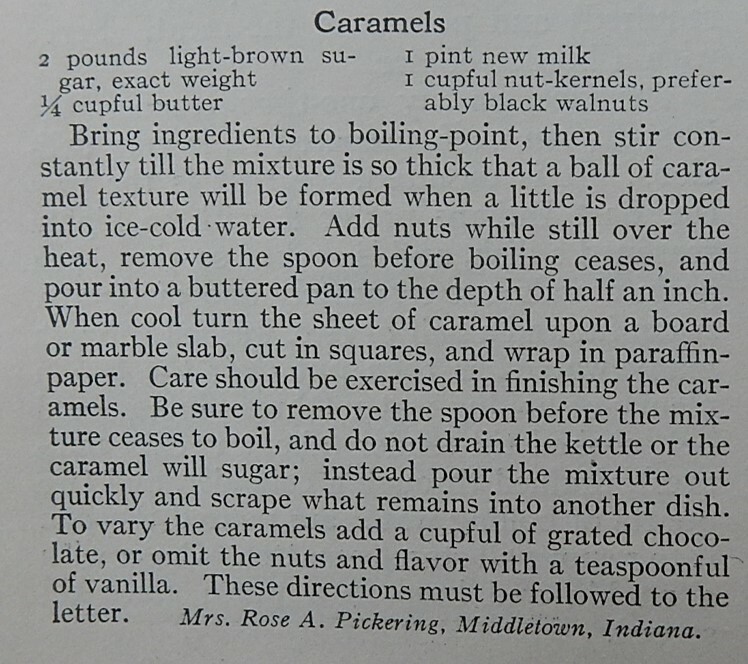 I made a Caramel recipe from a hundred-year-old magazine that listed nuts, preferably black walnuts, as an ingredient. My daughter made a Caramel recipe that did not call for nuts from Sally’s Baking Addiction called Sea Salt Vanilla Caramels. The Verdict: The two candies were both good, but very different from each other. The modern recipe was delectable. The Sea Salt Vanilla Caramels were smooth and creamy, and melted in my mouth. 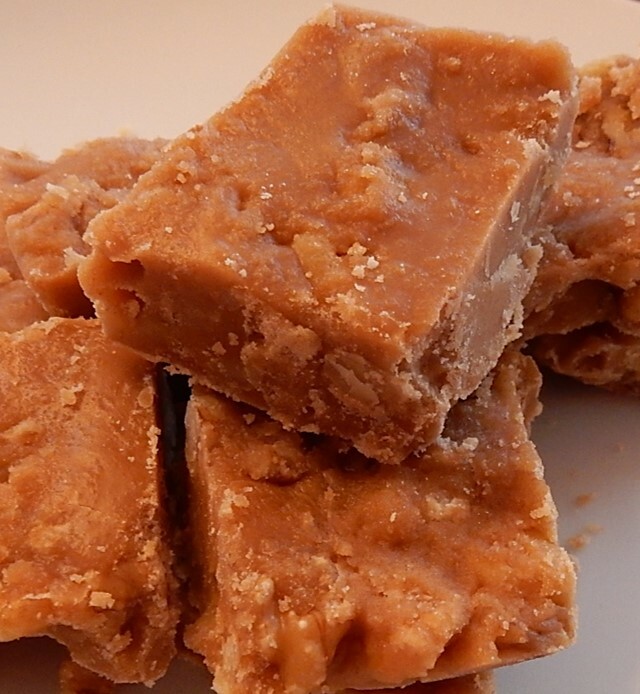 If you want a great Caramel recipe, I strongly recommend clicking on the link and going to Sally’s website for her recipe. 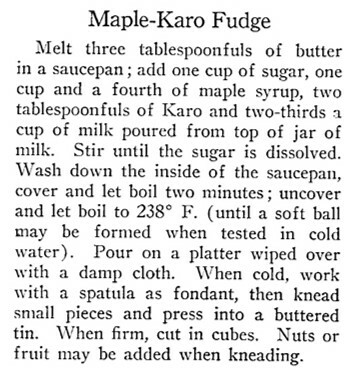 On the other hand, the hundred-year-old Caramel recipe made a candy that barely seemed like a caramel. It tasted more like a praline. If, by chance, you are looking for a delightful walnut praline recipe, the old recipe is the recipe for you. The hundred-year-old recipe included a warning, “These directions must be followed to the letter.” I tried my best to follow them to the letter, but apparently failed since I think that the caramel may have partially “crystalized” (or perhaps a caramel a hundred-years-ago was different from a modern caramel). Prepare a 8 inch by 8 inch square pan by lining it with foil, and then buttering the foil. Set aside. Put the brown sugar, butter, and milk in a large, heavy saucepan. Using medium heat, bring to a boil while stirring. Reduce heat so that there is a slow rolling boil. Continue to stir until the mixture reaches the firm ball stage (245 – 248° F.). This can also be tested by dropping a small amount of the hot mixture into ice-cold water. It is done when a caramel-textured ball is formed. Add nuts before removing from the heat. Remove spoon from mixture while still boiling to prevent crystallization. Quickly pour into the prepared pan. Scrape what remains into another dish. When cool turn onto a cookie sheet or board. Cut into bite-sized pieces. If desired, wrap caramels in waxed paper. I like candy, but always feel guilty when I eat it, so I was pleased to discover hundred-year-old advice on the role of candy in the diet. Candy is an energy-giving food, but, unfortunately perhaps, it is not (at all times) a most desirable energy-giving food. Sugar exists in candy in concentrated form. In this condition, sugar is irritating to the organs of digestion. Sugar is contained in large quantity in some fruits, especially in dried fruits, figs, dates, prunes, etc. These fruits are a much better source of sweets for children than is candy, because they do not contain as much sugar, and have, in addition, valuable food materials in the form of ash. Candy should never be used to excess. A little eaten at the end of a meal is not harmful to a normal person. At that time the sugar does not come in direct contact with the walls of the alimentary canal, as it would if eaten between meals. The quote mentions “ash” in fruits. Ash is an old-time term for the minerals in foods. 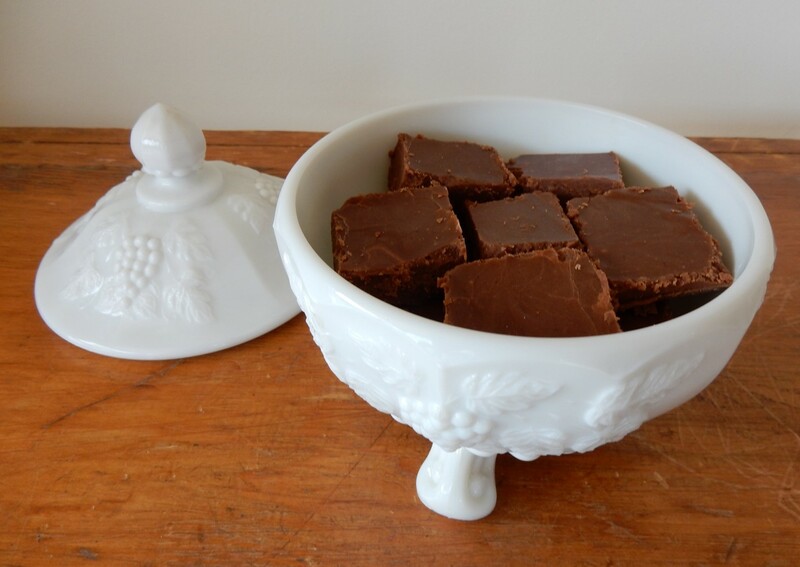 I love fudge, and when I saw a recipe for Nutmeg Fudge in a hundred-year-old magazine I just had to try to try it. The verdict—The fudge was wonderfully smooth and creamy. 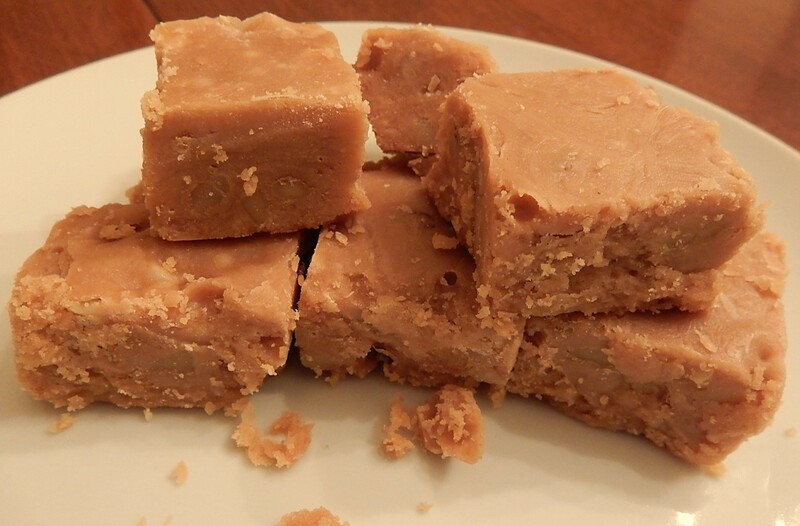 I noticed unexpected nutmeg undertones when taking the first nibble, but then the warm, spicy hint of nutmeg balanced nicely with the sugar to create a fudge that was less sweet than many fudges. Time: 1 hr. 15 mins. Combine brown sugar, milk, cream, and melted chocolate in a heavy saucepan. Using medium heat, heat until the mixture just begins to boil. Reduce heat to low and continue cooking without stirring until the mixture reaches the soft ball stage (235° F.). Remove from heat; then stir in butter, salt, and nutmeg. Cool until lukewarm; then stir vigorously until the mixture becomes creamy and begins to thicken. Pour into a small buttered pan (6” X 6”). When firm cut into squares. 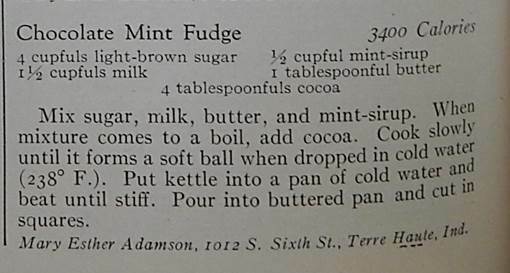 I recently flipped through the pages of the October, 1915 issue of Good Housekeeping and came across this recipe for Opera Cremes. This beautiful, delectable treat is one of the best homemade candies I’ve ever made. The pecans and creamy sweetness blend wonderfully to create a decadent taste sensation. I don’t know for sure why they are called Opera Cremes, but I do know that a hundred years ago almost every town—even small ones– had an opera house. Ruth and I went up to Watsontown with Pa this evening. The senior class gave their play in the opera house. Was the best one I ever was to. Some parts certainly did call forth plenty of laughter. Can hardly begin to describe how much I enjoyed it. Hmm . . . maybe between their laughs, they found time to enjoy a few Opera Cremes. In a medium saucepan, stir together sugar, cream, and cream of tartar until well blended. Using medium heat, bring to a boil. Reduce to low, and cook about 7 minutes without stirring until a very soft ball (237 degrees F.) is formed when tried in cold water. Remove from the heat. Allow to cool for a few minutes. 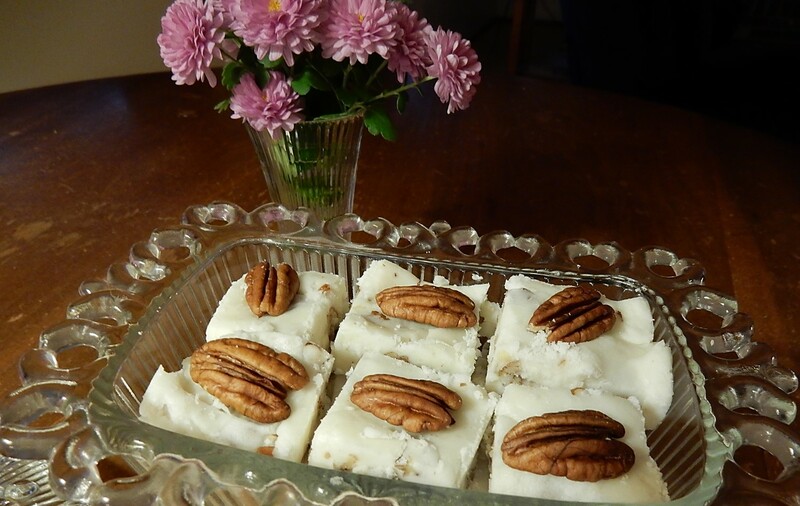 When tepid, stir in the vanilla and beat until creamy, then turn out on a board that is slightly dredged with confectioners’ sugar, and knead until smooth, working in the chopped pecans at the same time. Spread out in a shallow buttered pan, press on the pecan halves. Cool and cut into squares. Can also be shaped into bonbons. Shh .. . . don’t tell my friends, but I’m already planning to make Opera Cremes again in December to give as gifts.